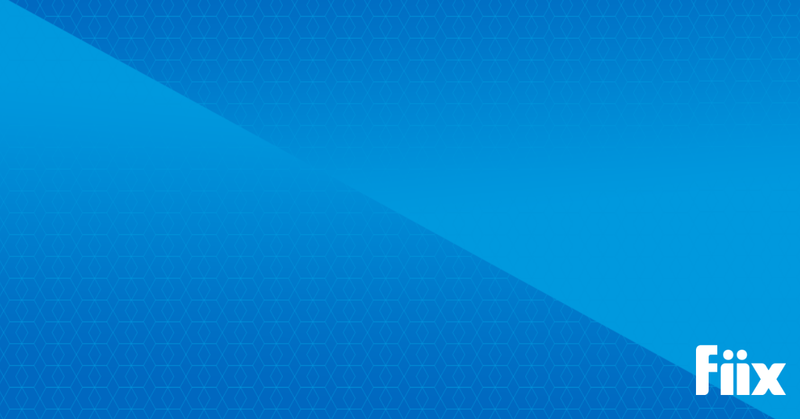 Fiix is pleased to release its CMMS Purchase Order module. 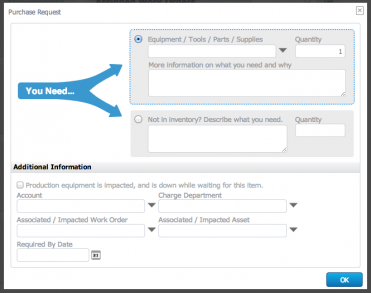 The purchase order module completes the parts management cycle so that parts can be tracked from requests to purchase to receipt to usage: all fully integrated into your CMMS. This includes formal Requests for Quotation and Purchase Orders that can be sent to your suppliers. Everything is managed using the Fiix purchase planning board. You’ll love the new purchase order module because your maintenance purchasing workflow will be more efficient, and you will be able to accurately track the parts you purchase, receive and use. The purchase order planning board is the hub of the purchasing module. As the central purchasing component every action is initiated from here. Every part that needs ordering finds a home here. And it is from the Purchase Planning Board that RFQs are sent and POs are generated. The slideshare below shows its central position in the purchasing lifecycle between user requests and PO and RFQs. After selecting a supplier in the purchase planning board, the purchase planner sends Requests for Quotation (RFQs) and Purchase Orders (POs) to those suppliers. To add a part to a RFQ or PO, simply check their box, and click on the “Request Quote” or “Generate RFQ”. The purchase planning board is arranged by supplier. If you want to move a part from one supplier to another, just click the change supplier button. 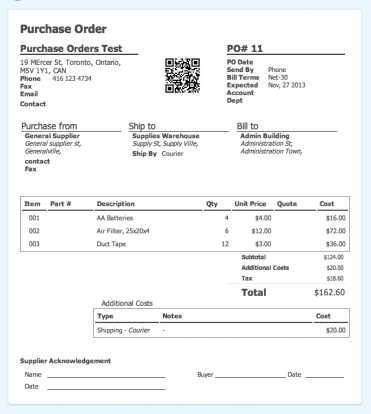 The purchase order module is flexible enough to allow new parts, RFQs and POs to be added at any stage of the process. Do you need a part or supply? If so, simply click on the button in your CMMS, or the button accessible from your dashboard. Fill in the details of the part you need, and the number required and it will appear on the Purchase Planning Board, ready to be ordered. An RFQ allows a supplier to give you a firm price for the supply of goods you need. If you want or need them, you can generate and send an RFQ from the Fiix Purchase Planning Board. Just add the critical information, like the expected delivery date and the part numbers, if known, before sending it to the supplier. If the supplier wants your business, they will send you back their quote. Do you need to send multiple RFQ’s? Send one to your first supplier, change to a second supplier and send an RFQ to them as well. A purchase order is a formal document promising payment for the goods requested. To create one, simply check the checkbox of the part you want in the Purchase Planning Board and click “Create PO”. Or, perhaps you have an RFQ that you are happy with, click “Create PO” directly from the RFQ. Easy. Then fill in the important information, like the delivery address, and send it to the supplier. You can expect your goods to be delivered as soon as they are available. If your business requires approval by a purchasing officer before maintenance purchases are made, then this can be easily enforced within the CMMS. Your purchase officer will receive an email, log into the CMMS and approve or deny the purchase request with one click. When your parts are delivered, you need to record that you received them. Your Fiix Purchasing module makes this easy. 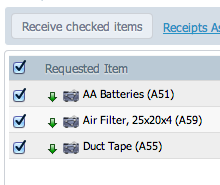 Click on the parts that were delivered, note how many and where they were put and click receive. Your parts are now part of the CMMS, ready for use in a work order. Don’t like performing stock takes on your parts? You don’t have to. Each time you consume a part while you are working, record that fact in your work order. Automatically, your supply levels will decrease by the number you use. You can easily set your CMMS to automatically send an RFQ when the quantity of a part falls below a critical value. These parts will also be added to your Purchase Planning Board. Just set the minimum and restocking quantities, and the RFQ’s will be automatically sent out to the suppliers that you choose. Then, pick the supplier of your choice and send out a Purchase Order.